Turkey will conduct 'operations' against Erdogan's enemies in U.S.
"This is a blatant and alarming admission ... of actions by the Erdogan regime in clear violation of international law." LONDON — Despite being a NATO ally, Turkey has vowed to target opponents of President Recep Tayyip Erdogan on foreign soil, including in the United States. 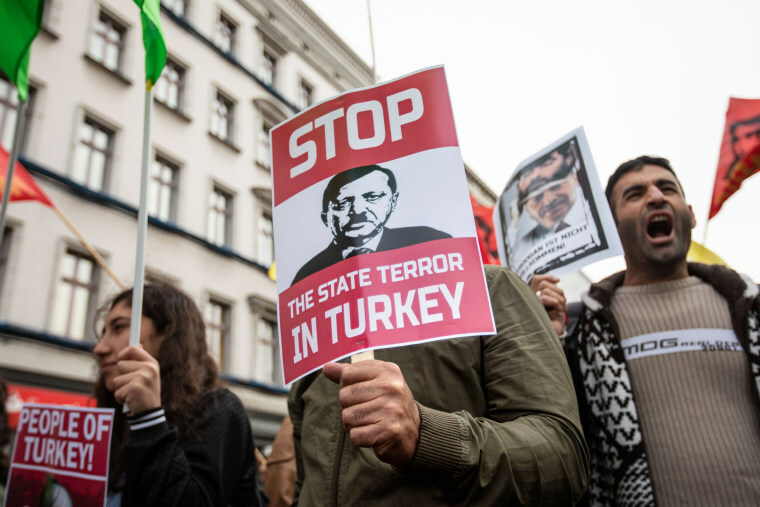 The threat comes amid diplomatic tensions over Americans jailed in Turkey and the arrest or abduction of dozens of Turkish citizens in almost 20 countries. Erdogan spokesman Ibrahim Kalin said Turkey’s National Intelligence Organization would launch overseas “operations” against supporters of Fethullah Gulen, an elderly cleric who lives in exile in Pennsylvania. “They will feel Turkey breathing down their neck,” Kalin told reporters in Ankara. Erdogan accuses Gulen of orchestrating the July 2016 coup attempt and has referred to his global movement as FETO, which stands for “Fethullah Terror Group.” Gulen denies having any role in the putsch. Turkey has repeatedly pressed the White House to extradite Gulen, while officials are working inside other countries to detain and remove his followers. Thousands of Erdogan opponents live in exile around the world. In the U.S., they include the New York Knicks' Enes Kanter who cannot return to Turkey after Erdogan canceled his passport and issued an international warrant for his arrest. But while the U.S. has not responded to Erdogan’s extradition demands, countries with closer ties to Turkey have been more compliant. Seven teachers in Moldova, who had applied for asylum, were detained and deported to back to Turkey on Sept. 7, prompting condemnation from Amnesty International. The wife of Mustafa Ceyhan, a businessman, reported that he was kidnapped on April 28 outside a courthouse in Azerbaijan. Turkish authorities later confirmed he had been taken to Istanbul where he was put in pre-trial detention. In total, Turkey has admitted detaining at least 80 citizens in 18 countries since it launched a post-coup crackdown so vast in scope that it is building hundreds of extra prisons. Alp Aslandogan, executive director of the Alliance for Shared Values, a New York-based nonprofit and part of the global Gulen movement, said: "This is a blatant and alarming admission by Turkey’s presidential spokesperson Ibrahim Kalin of actions by the Erdogan regime in clear violation of international law and agreements to which Turkey is a party." Turkey's president looks on as bodyguards clash with protesters in D.C. Earlier this year, U.S. prosecutors dropped charges against 11 of the 15 bodyguards for Erdogan who were indicted after a brawl with protesters outside the Turkish embassy in Washington in May 2017.